Date of the Battle of Laing’s Nek: 28th January 1881. Place of the Battle of Laing’s Nek: In the northern tip of Natal near to the Transvaal Border, in South Africa. Combatants at the Battle of Laing’s Nek: British against the Boers. Commanders at the Battle of Laing’s Nek: Major General Sir George Pomeroy Colley and Commandant General P. J. Joubert. Size of the armies at the Battle of Laing’s Nek: 1,200 British troops against 3,000 Boers. The British infantry in South Africa at that date wore red jackets, blue trousers with red piping to the side, white pith helmets and pipe clayed equipment. The standard infantry weapon was the Martini Henry single shot breech loading rifle with a long sword bayonet. Gunners of the Royal Artillery wore blue jackets. The Boers, being essentially a citizen militia, wore what they wished, jacket, trousers and slouch hat with a bandolier and carried hunting rifles. The Boers were mainly mounted infantry, riding the ponies, they used to tend their stock, many with a life time’s experience of marksmanship. They carried no bayonet leaving them at a substantial disadvantage in close combat, which they avoided so far as possible. Winner of the Battle of Laing’s Nek: The Boers. 58th Regiment: later 2nd Battalion, the Northamptonshire Regiment and now the Royal Anglian Regiment. 2nd Battalion, 60th Rifles: later the King’s Royal Rifle Corps and now the Rifles. Laing’s Nek is not a British Battle Honour. The British annexation of the Transvaal Republic in April 1877 brought about the First Boer War, although it took some years to break out. On 20th December 1880, Lieutenant Colonel Anstruther and elements of his regiment, the 94th, marched from Lydenburg to Pretoria, the regiment’s band leading the column playing the popular song ‘kiss me mother darling’. At Bronkhorst Spruit the force was stopped by Boers who courteously required the ‘Red Soldiers’ to turn back. Armstrong equally courteously refused, at which the column was devastated by rifle fire from the surrounding Boer ambush. Of the 259 in the column, 155 officers and men became casualties, as did some of the women accompanying the regiment. The British High Commissioner for South East Africa, Major General Sir George Pomeroy Colley, instead of waiting for the reinforcements that were, on the outbreak of the war, sent to Southern Africa, assembled what troops he could and rushed forward, claiming to be moving to relieve the British garrisons in the Transvaal. Colley gathered his force at Newcastle in Natal, dispatched an ultimatum to the Boers and, on its rejection, advanced towards the Transvaal border. The first British camp on the march lay some four miles short of Laing’s Nek, a ridge that blocked the road, occupied by a Boer force. On the morning of 28th January 1881, Colley moved out with his troops, five companies of the 58th Regiment, five companies of the 3rd Battalion, the 60th Rifles, a company of mounted infantry, a party of Royal Navy sailors and four guns of the Royal Artillery. Colley took the road that climbed up to Laing’s Nek. On each side, hills occupied by Boer riflemen overlooked the road. Colley led his force forward and wheeled to face the Boer positions on his right flank, causing the British rear to be exposed to the Boers holding the hills on the left side of the road. The battle began with a bombardment of the Boer’s left wing, inflicting slight casualties and a charge by the British mounted troops up the hill, which was repelled with some loss. This failed assault was followed by an attack further to the left, delivered by the companies of the 58th Regiment, led by Colonel Deane. 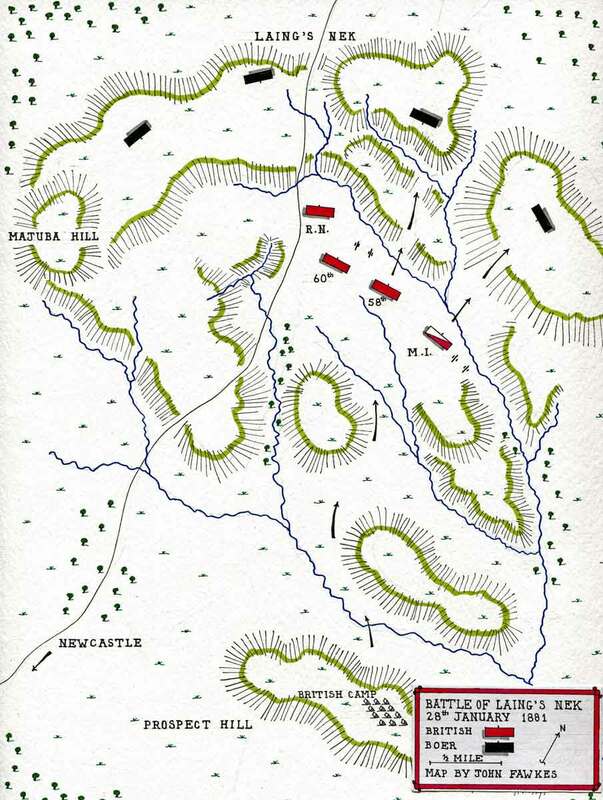 The Boers, moving forward to shoot into the regiment’s flanks, opened a devastating fire on the red coated infantry, as they climbed the open hillside. 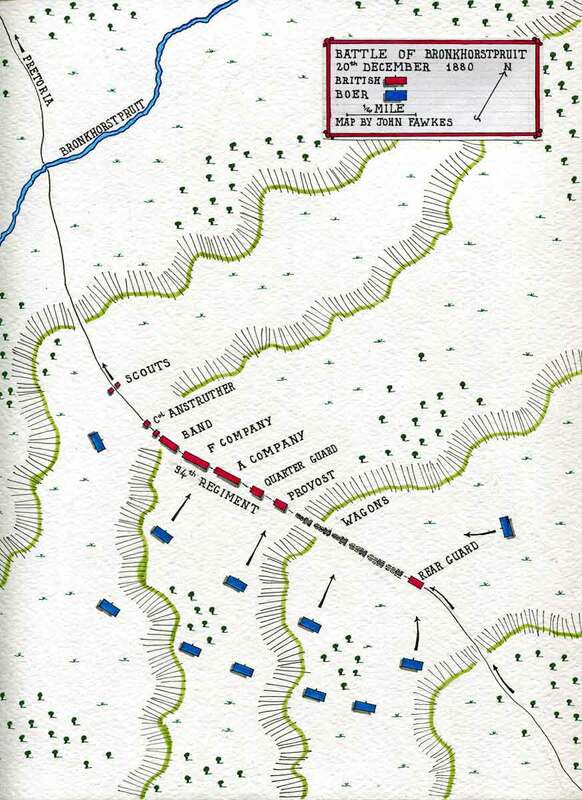 The 58th suffered considerable casualties, including Colonel Deane and most of the regiment’s officers, before finally abandoning the attack and retiring to the bottom of the hill. The ‘Cease Fire’ sounded, ending the battle. A truce was negotiated, whereby the Boers permitted the British surgeons to attend the wounded on the hillside. Casualties: British casualties were 198, of which 173 were from the 58th Regiment, including many of the battalion’s officers. Boer casualties were 41. Follow-up: General Colley mustered his forces before moving forward for the disastrous battle at Majuba Hill. Laing’s Nek is memorable as the last occasion that a British regiment took its colours into action. The 58th were led up the hillside by Lieutenant Baillie carrying the Regimental Colour and Lieutenant Hill carrying the Queen’s Colour. Baillie was mortally wounded, while Hill won the Victoria Cross for bringing casualties down from the hillside. Hill passed the two colours to Sergeant Budstock for safe keeping, a necessary concession to the realities of late 19th Century combat. Trooper Doogan of the 1st King’s Dragoon Guards won the Victoria Cross for riding back and rescuing the wounded Major Brownlow, in spite of being wounded himself. The 58th became the 2nd Battalion of the Northamptonshire Regiment. The colours remained in service, carefully repaired, until the disbanding of the battalion after the Second World War and can be seen in the Regimental Museum in Abington Park, Northampton. The 60th, being a rifle regiment, did not possess colours. The Battle of Laing’s Nek was the first occasion that Britain’s troops suffered from the effectiveness of Boer riflemen in the field. The British were contemptuous of the Boers as soldiers during the Zulu War, without realising they possessed qualities well suited to fighting fewer and less ruthless troops like the British Regular forces, rather than the massed and highly mobile Zulu warriors.